The 2013 Ford Fusion, that was recently named Green Car of the Year, gives a nod to the Fusion Energi plug-in hybrid, rated by the US Environmental Protection Agency at 108 MPGe, making it arguably America’s most fuel-efficient vehicle. Well the EPA has rated a gallon of gas as equivalent to 33.7-kilowatt hours of electricity. The problem is it’s an energy equivalent that bears no relation to dollars and sense. Does the 33.7-kilowatt hours cost the same as a gallon of gasoline? Actually it costs much less in most places, but what it costs exactly is generally undefined. The power company can tell you, but when you charge your car determines how much the electricity costs. You know you can fill your 14-gallon gas tank, spending about $40, in about 5 minutes. Your plug-in car can go say 50 to 300 miles on a charge, but that takes from four to eight hours. This is where the EPA’s equivalent breaks down. If time is money, then money is time. So what does 108-MPGe tell us, except that the EPA thinks maybe you should buy one? What we need is a way to compare cars that use gasoline, diesel, natural gas or electricity in a way that equates to both these concepts! This would free people from hours of research and a number of articles on sites just like this one, without really understanding how to compare these variables in application to a particular lifestyle or region. Getting back to Ford – incidentally, none of the above is their responsibility – the Fusion Energi marks the brand’s fifth electrified vehicle launched during the last year. Ford is accelerating investment in hybrid technology and it’s paying off in sales with November racking up the highest monthly hybrid sales month yet. Despite the currently low price of gas, Ford is now ranked first in fuel economy and customer satisfaction by J.D. Power, replacing Toyota as the efficiency leader in every category the two compete. One fact that does make sense is the EPA rating that the Ford Fusion Energi Plug-in could potentially save customers $6,850 on fuel over five years. Of course, this is another place where the EPA ratings are not really useful. When you see a sticker with an annual fuel cost estimate, does it really mean much? If you fit some national average, drive a predictable amount, live in a place where gas is at a median price and think of yourself as average, maybe it works. Does anyone think they are average? 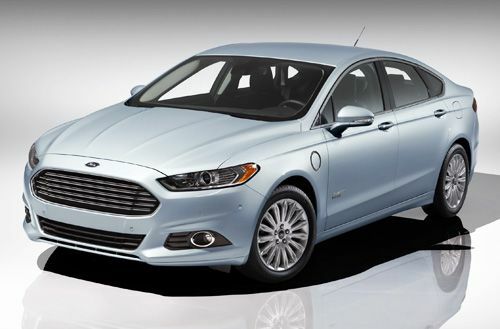 Certainly no one who would buy a Ford Fusion Energi Plug-in! “The Fusion Energi plug-in hybrid is the exclamation point for Ford’s transformed lineup of fuel-efficiency leaders that now beats Toyota across the board,” said Raj Nair, group vice president, Global Product Development. Notably Ford has gone out of their way to provide handy things for the new hybrid driver like customizable displays, with instantaneous economy readings and a built in coach to help drivers optimize their fuel efficiency. Ford’s Plug-in hybrids and all-electric models also have options for monitoring the battery’s state of charge. EV+ adds the built-in navigation system of Ford SYNC with proprietary software algorithms to store frequent destinations to maximize drive time in electric mode. Though they have gotten into the game late, Ford’s electrified vehicle lineup is up and running. Projecting more than 19,000 hybrid vehicle sales, the automaker expects to set an all-time record with fourth-quarter hybrid sales. More than half the brand’s 2012’s hybrid sales will come during the quarter that ends next week. During last October and November, the all-new C-MAX was the fastest-ever selling hybrid at launch with 8,030 units sold. The C-Max outpaced the Toyota Camry Hybrid introduction that sold 7,300 sedans in its first two months during 2006. The addition of Fusion Energi gives customers yet another Ford option when shopping for an electrified vehicle, added to the Focus Electric, Fusion Hybrid, C-MAX Hybrid and C-MAX Energi. The Ford Focus Electric was introduced late last year, followed by C-MAX Hybrid and C-MAX Energi. Those two vehicles make up Ford’s first hybrid-only line in North America. If you are still wondering what 108-MPGe really means, please review Torque writer David Herron’s explanation of why electric cars are cheaper to drive. "Your plug-in car can go say 50 to 300 miles on a charge, but that takes from four to eight hours. " unless you use a fast-charger, 80% full in 20mn, 100% in under 1 hour for most EVs. Couldn't agree with you more on MPGe " an energy equivalent that bears no relation to dollars and sense." We shouldn't use it, it makes no sense and gives people a false sense of comparison. Both Fusion and C-MAX drive well and makes sense besides this ridiculous notion of MPGe, but then again so is horesepower, SAE or DIN, or simple horse power.